Londolozi Founders Camp offers guests luxury accommodation in the Sabi Sand Game Reserve in elegant West African inspired chalets. Londolozi, meaning 'Protector of all living things', has a rich heritage with roots dating as far back as 1926. The camp is well known for its Leopard sightings. This Sabi Sand game lodge has 10 beautiful chalets secluded in a dense riverine forest overlooking the Sand River. Experience a truly intimate safari at Founders Camp in the greater Kruger National Park. The luxurious air-conditioned chalets at this Sabi Sand game lodge feature original mahogany beds, full indoor en-suite bathroom facilities, a stone-laid outdoor shower and wooden deck from which you can enjoy the views out over the African bush. Londolozi Founders Camp is situated in the Londolozi Reserve, which was the first game reserve in the world to achieve Relais & Chateaux status. 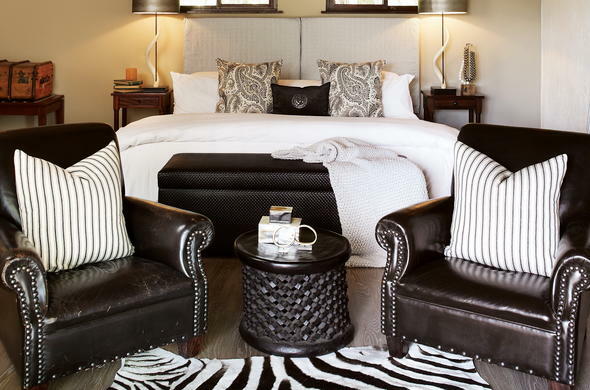 The suites at this Sabi Sand accommodation are decorated in warm, rich sand colours. Additional classic touches include deep leather couches, military chests and compass safari lamps in the central guest areas. Dinners are served in a clearing in the bush under a star-studded sky, dining under the stars is an unforgettable African bush experience. Relax in a chair on the deck as you spot abundant wildlife in the reserve.